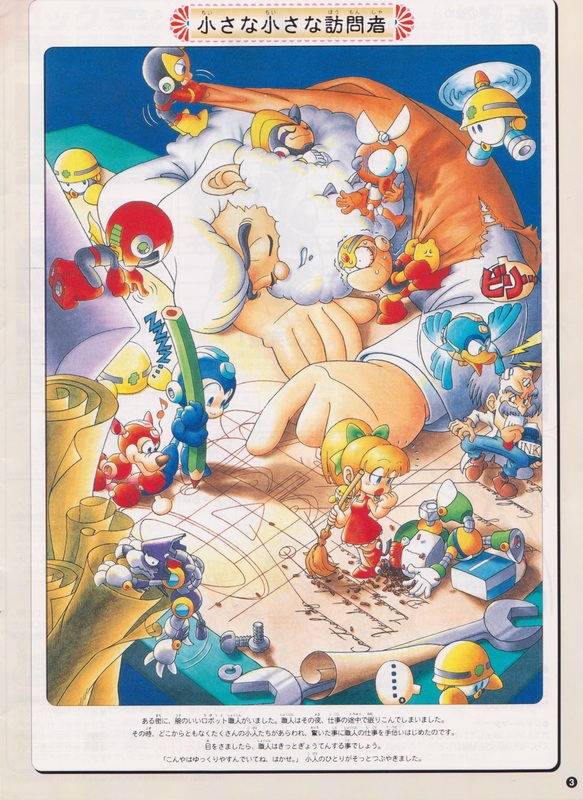 I’m putting Duo week to bed with one last image from the Grand Rockman Exposition ’96 Secret File. Once upon a time, there lived in a certain town a skilled craftsman of robots. And one night, while still hard at work, the craftsman had fallen into a deep sleep. It was then that suddenly and out of nowhere, a bushel of gnomes appeared – and much to anyone’s astonishment, they began to help the craftsman with his work. Had he opened his eyes and awoke at that very moment, the craftsman would surely have received quite a start! “You just rest well tonight, dear doctor,” one of the gnomes gently whispered. I guess that answers the question of how Dr. Right was able to rework Duo’s superior alien technology so quickly – he wasn’t! It was the gnomes all along. It all makes perfect sense now! Just kiddin’. Sweet dreams, Duo week. Of course, there’s certainly more Duo material out there to be translated, but for now, let’s just let it rest a while, shall we? I hope you enjoyed this week-long look at the extraterrestrial power fighter. Even though it was supposed to happen a month ago. Regular updates return next week, hopefully. Let’s keep our fingers crossed! « Big Duo, it is now SHOWTIME!